The restaurant at the Hotel Carabela has excellent views and is where breakfast and dinner are served daily. 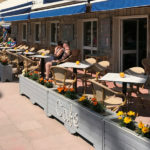 Customers also have the option to have breakfast on the seaside terrace. Breakfast is a buffet with fresh fruit, an assortment of sweet pastries, bread and rolls, cereals, jam, cheeses, charcuterie, eggs, fruit juices, coffee, tea, milk, etc. – all the ingredients necessary to enjoy a Continental or British breakfast. The evening meal is also a buffet with a wide variety of hot and cold dishes (salads, stews, meat, fish, pasta, desserts, etc.) made with fresh, top-quality ingredients.